Haunted Mansion is an excellent track ride in New Orleans Square and one of the best attractions at Disneyland. Enter through the front porch of this antebellum mansion, then descend below ground via the stretching portrait room to waiting doom buggies below for a musical journey through the world's most famous haunted house. This ride changes every Christmas to be themed after "Nightmare before Christmas" and is not at all the same. It has blacklights and more cartoon like. Trivia spoilers: In Disneyland's Mansion you descend in the stretch room. In Walt Disney World's Mansion though, you remain still while the ceiling rises above you. 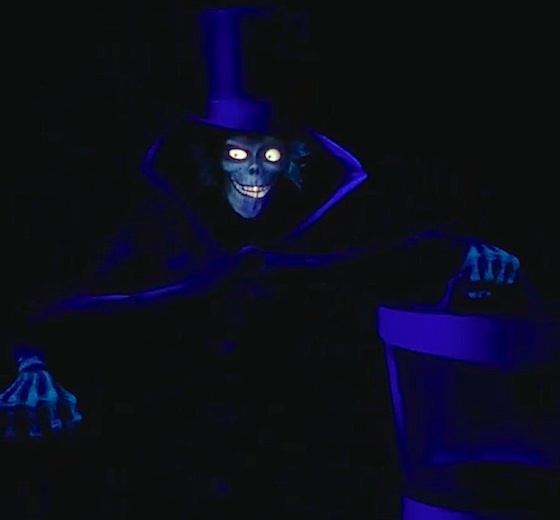 The head in the crystal ball (the face is of Disney Imagineer Leota Toombs and the voice is of Cinderella's wicked stepmother, Eleanor Audley) and the ghosts in the ballroom are not holograms. Look for the "hidden Mickey" (Mickey's head) on the ballroom table made by a plate and two saucers, and in the white robe of the phantom in the mausoleum as you leave the graveyard scene. The face and voice of the little woman at the end is also that of Leota Toombs. During the Haunted Mansion Holiday make-over of the Mansion, the real daughter of Leota Toombs replaced her in the crystal ball. Regardless if this is in the Nightmare Before Christmas overlay or the normal show, this is a must ride for all visitors. It's one of the best creations at Disney Parks and has withstood the test of time. From the theme, music, details in set design, and even the ride vehicles, the immersion is unparalleled. I personally prefer Haunted Mansion over Pirates of the Caribbean just for the lore alone. The themeing is top notch, and the soundtrack is timeless. If this ride didn't move so fast, it would be "absolutely" enjoyable. During October, when it's dressed up, it's really enjoyable - again, if it didn't move so fast.